Created with extensive input from the community, the Town of Dover Transit-Oriented Development (TOD) Plan calls for a pedestrian and transit-oriented town center designed to serve as a vibrant hub of civic activity. The Plan also aims to connect Dover’s diverse population and its rich history and architecture—including its rail station and cultural resources—in a coordinated fashion. Incorporated as a village in 1826 and as a town in 1869, Dover was once a manufacturing hub. During the second half of the twentieth century, Dover’s vibrant downtown lost population and jobs to suburban growth. Like many towns across the state and the nation, it suffered out-migration and plummeting property values. Recently, Dover has experienced resurgence because of infill development and redevelopment and has become a regional center with a culturally diverse population, although the median income is considerably lower than the average for Morris County and the state. The Transit-Oriented Development (TOD) Plan, prepared by Heyer, Gruel & Associates, was adopted in October 2006. It addresses some of Dover’s key physical planning issues: mass transit, economic development, public spaces, and pedestrian and vehicular circulation. It is one of only few plans in New Jersey that employs innovative zoning code standards that emphasize form and function rather than numerical density calculations. This creates a focus on a strong sense of place rather than technical density allowances. 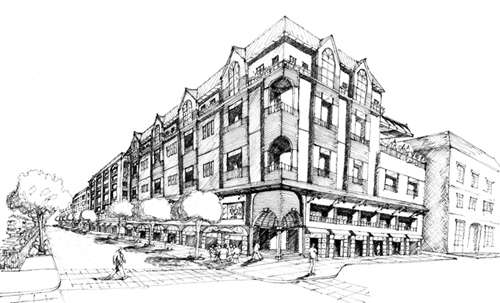 Using Traditional Neighborhood Design techniques that provide residents with opportunities for social interaction, the plan calls for approximately 550 new housing units, and 50,000 square feet of retail space, which will help to strengthen the vitality and tax base of the entire town. Included are two acres of open space with public parks, civic plazas, and rails-to-trails jogging and biking paths designed to enhance pedestrian circulation in the downtown area and increase ridership for Dover Station. A redesigned, pedestrian-friendly station area will be enhanced by adjacent town-owned commuter parking facilities. This supports the civic activity hubs of Town Hall and the Post Office, as well as the planned redevelopment of a former urban renewal site along Bassett Highway. From the onset, community leaders involved all stakeholders and ethnic groups in an extensive public participation process to resolve concerns of existing residents, especially about the amount and density of housing to be provided, the number of school children, and the need for economic development. Five pubic meetings and three days of stakeholder interviews resulted in rich discussions that took particular care to include the Hispanic and Latino community, which makes up about sixty percent of the town’s population. This process led to the plan’s form-based approach, and many Dover residents became excited about the possibilities resulting from it. Ultimately, all sides endorsed the plan and the process. Dover’s TOD Plan, funded by the state’s Office of Smart Growth, is now a core component of the town’s new and revised Master Plan. Its success is evident already, as it has attracted the interest of several redevelopers, who have expressed interest in giving this bold vision concrete shape.